Prepare the broth in a saucepan. Meanwhile, peel and finely chop the onion, peel the sausage and cut it into small pieces. In a pan melt the butter, add sausage and the onion and cook them for 10 minutes over low heat. 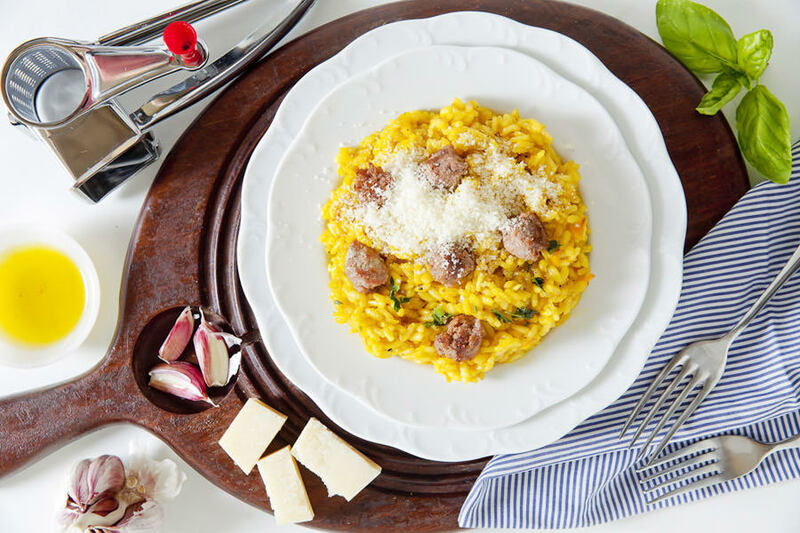 Add the rice, toast it for a minute and simmer with a glass of ASTI Docg until reduced. Add the rice, toast it for a minute and simmer with a glass of ASTI until reduced. Continue to cook the risotto by adding more broth (1 a ladleful at a time) when the rice begins to look dry. Cook the rice for 10 minutes and then add saffron, salt and pepper. Mix and serve with Parmigiano Reggiano and parsley.